Spend $35 on Stampin' Up! products and get 25% off any On Board items from the Spring-Summer Collection. 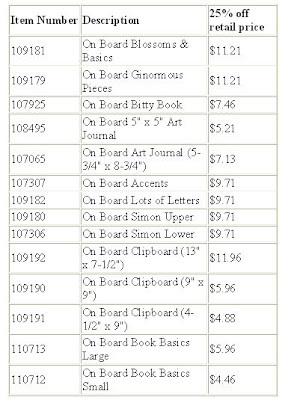 There is no limit to the number of discounted chipboard products a customer may purchase once the qualifying order of $35 has been reached. This offer is being made in conjunction with the Cutting Mat/Hobby Blade combo pack special offer; during the month of May, buy a Cutting Mat and get a Hobby Blade for FREE!